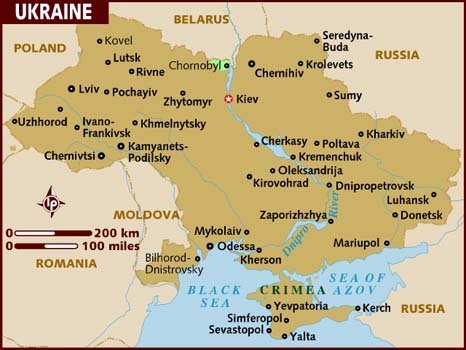 Here's some background information about Ukraine, the second-largest European country in area after Russia. It borders Moldova, Romania, Hungary, Slovakia, Poland, Belarus, Russia and the Black Sea in Eastern Europe. April 26, 1986 - Reactor 4 explodes at the Chernobyl, Ukraine, nuclear power plant, releasing large amounts of radiation into the atmosphere. More than 30 people died and countless others later died from radiation symptoms. The government evacuated some 135,000 people from the area and the 19-mile exclusion zone around the plant remains uninhabitable. January 2005 - President Yushchenko names Yulia Tymoshenko as prime minister. January 17, 2010 - Presidential elections are held. President Yushchenko receives only 5% of the vote. Yanukovych receives 35% and Tymoshenko receives 25%, necessitating a run-off. November 21, 2013 - President Yanukovych backs out of a trade deal with the European Uniondue to pressure from Russia. Street protests begin in Kiev. December 17, 2013 - Russian President Vladimir Putin agrees to buy $15 billion of Ukraine's debt and reduce the price of natural gas supplied to the country. January 16, 2014 - President Yanukovych signs laws restricting the right to protest. This leads to large numbers of protesters in Kiev and clashes with police. The law is repealed on January 28. February 21, 2014 - Negotiations lead to a deal which reduces President Yanukovych's powers as president and rolls back parts of the Constitution. February 22, 2014 - Parliament votes to remove President Yanukovych from office. On the same day, former Prime Minister Tymoshenko is released from prison. February 24, 2014 - An arrest warrant is issued for ousted President Yanukovych. March 3, 2014 - Ukrainian Ambassador Yuriy Sergeyev tells an emergency meeting of the U.N. Security Council that Russia has used planes, boats and helicopters to flood Crimea with 16,000 troops in the past week. March 4, 2014 - U.S. Secretary of State John Kerry visits Ukraine and announces the United States will give Ukraine's new government a $1 billion loan guarantee. Senior U.S. administration officials tell CNN this will help insulate the Ukrainian economy from the effects of reduced energy subsidies from Russia. March 6, 2014 - Crimea's parliament votes to hold a referendum on leaving Ukraine and becoming part of Russia. The referendum is scheduled for March 16. March 17, 2014 - United States and European Union officials announce sanctions on more than two dozen Russian officials and their allies in Crimea. Crimea's regional parliament applies to join with Russia and in Moscow, Russian President Vladimir Putin signs a decree that recognizes the independence and sovereignty of the Republic of Crimea. March 18, 2014 - In Moscow, Russian President Vladimir Putin signs an annexation pact with the Prime Minister of Crimea and the mayor of the city of Sevastopol. March 21, 2014 - Ukrainian Prime Minister Arseniy Yatsenyuk, in Brussels, signs the political elements of a trade pact with the European Union. March 22, 2014 - In Crimea, Russian special forces take control of Belbek Airbase, and pro-Russian self-defense forces take control of Novofederoskoe military base and the Ukrainian ship, the Slavutych. March 27, 2014 - The International Monetary Fund agrees to allow Ukraine to borrow up to $18 billion over the next two years. The U.N. General Assembly approves a resolution stating Crimea's succession referendum from Ukraine is not valid; the resolution's vote is 100-11, with 58 abstentions. June 7, 2014 - Poroshenko is sworn-in as Ukraine's new president. June 27, 2014 - Ukraine signs a trade deal with the European Union, the same agreement that former President Viktor Yanukovych backed out of in 2013. July 24, 2014 - Prime Minister Arseniy Yatsenyuk and his cabinet announce their resignation. A week later, parliament rejects his resignation. October 26, 2014 - Ukrainians vote in parliamentary elections. Ukrainian citizens in Russia-annexed Crimea and the eastern areas controlled by pro-Russian separatists do not participate in the elections because of ongoing violence. President Petro Poroshenko hails exit poll results and says the projected outcome gives "a powerful and irreversible backing to Ukraine's path to Europe." January 26, 2015 - President Poroshenko announces the Ukraine will ask the Hague tribunal to investigate alleged "crimes against humanity" in the conflict in eastern Ukraine. February 5, 2015 - With U.S. Secretary of State John Kerry by his side, Ukrainian Prime Minister Arseniy Yatsenyuk says the Russian military is on the ground in the country. February 11, 2015 - French President Francois Hollande, German Chancellor Angela Merkel, Ukrainian President Petro Poroshenko and Russian President Vladimir Putin meet in Minsk, Belarus for peace talks. April 10, 2016 - Ukrainian Prime Minister Arseniy Yatsenyuk announces he will resign.